Every year for St. Patrick's Day, we have some family over for a traditional corned beef and cabbage dinner. This is the invitation I'm sending out this year. I found some cute patterned paper from the Simple Stories Take a Hike collection, which I used for my color inspiration. 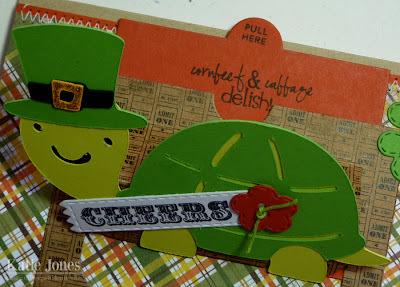 The cute little shamrock was cut with a die from the new My Creative Time You're My Pot of Gold stamp and die set. I love this turtle with a top hat from the Cricut Create a Critter 2 cartridge! I cut him at 3" and added a little gold Stickles to his top hat. 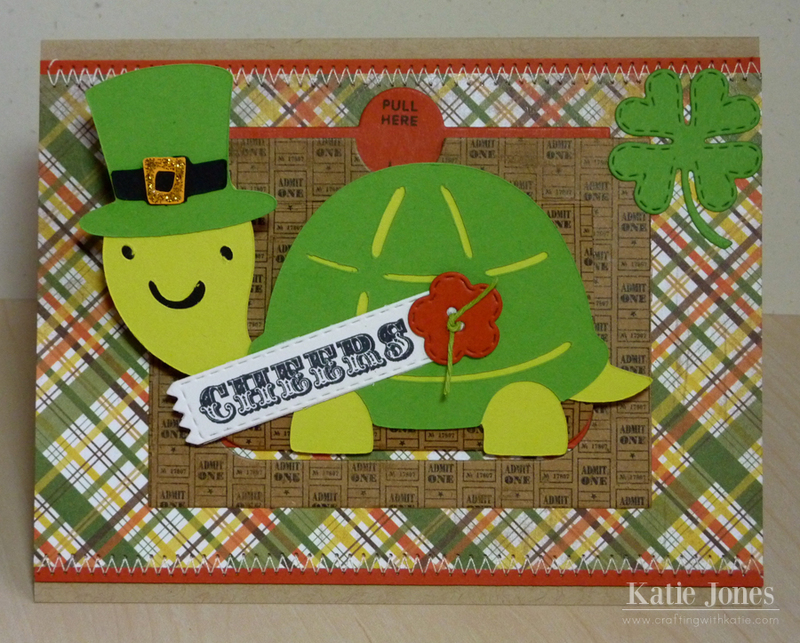 The "CHEERS" sentiment is from You're My Pot of Gold, stamped onto a die from MCT's Just Simply Live. I topped that with a button made from MCT's Stitched Button Dies, tied with a little green hemp from Liz's Paper Loft Boutique. I used the Papertrey Ink Movers & Shakers: Sliders dies from Papertrey Ink to add a fun element to the card. 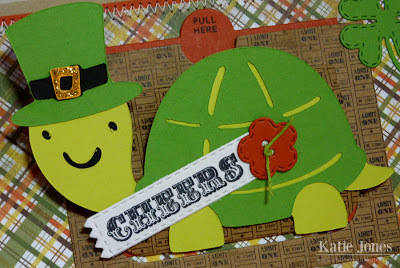 When the recipient pulls the tab, the turtle slides up and a message (from MCT's I Believe in Leprechauns) is revealed! A die to make slider cards? I need to check that out :D Your invite card is so cute...everyone will love it! what a sweet invite, katie! Love it. You always have such great things. You are very talented. so sweet, love the layering and prints !!! Katie ~ Oh look at your ADORABLE St. Patty Day invites!!! I LOVE them!! That stamp is so fun & PERFECT to use for your slider invites! TOTALLY forgot you do this every year~ what a GREAT family tradition best part is I have your recipe too!! You family has to LOVE getting these ADORABLE invites! Just saw this and it's adorable. But, the PTI links for the slider brings me to PTI, but there's no die or sentiments. I guess it's discontinued, or do you know?